It’s about time we added some teas to our ManTeas line of manly teas, so here’s a new offering available exclusively on 52teas (at least until I find time to add it to the ManTeas.com site). We’ve blended our premium Indian black teas with organic cacao nibs, imitation bacon bits and natural (and believe it or not, Kosher and vegan!) flavors. For those of you who have feared the imminent heart attack associated with trying one of these carnival/fair delicacies, fear no more. 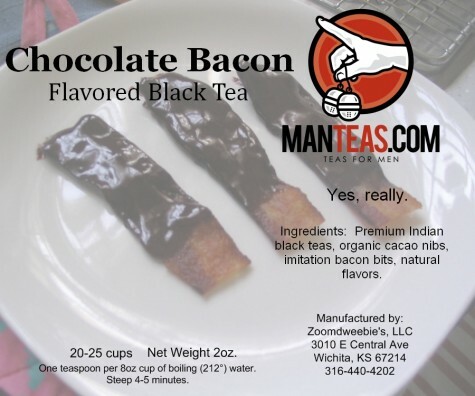 Enjoy your chocolate covered bacon treat in tea form! The bacon part of this concoction reminds me very much of the Maple Bacon tea that I mentioned a few moments ago. And, if you read the review that I provided the link for above, you will see that in my previous tastings of the Maple Bacon tea, I had some difficulty actually tasting the bacon flavor. But, since that time, I have learned the secret – a pinch of salt! A pinch of salt gives this tea just what it needs so that the bacon flavor is able to express itself properly. Now, as for the chocolate – well, if you’ve read any of my reviews of the past, you are probably familiar with my love of chocolate. The chocolate flavor here is nice, and it doesn’t overwhelm the bacon taste. It is a pleasant balance… but the chocoholic in me is still wanting more chocolate despite the realization that more chocolate would possibly overpower the harmonious combination of flavors that is in my teacup right now. Overall, I really enjoyed this tea. It is very unique and some would even argue a bit of a novelty (noveltea?) but I for one appreciate unusual and unique flavors such as this. It makes life just a little more fun when I can go to my tea cabinet and choose a tea like this – something that is a little different, something fun, and still get that enjoyment from sipping a delicious cup of tea!